The logic of capitalism is that of dividing and sharing. Only that in capitalism, people do not share, but rather, they themselves are divided up. For this reason, the British historian E.P. Thompson claims that »it was always a problem to explain the commons with capitalist categories«. Whoever enters into the world of the commons encounters another logic, another language and other categories. In this volume, authors from all continents investigate the anthropological foundations of the commons, and propose them at the same time as concrete utopias (E. Bloch). They make it possible to understand that everything is, or can become, commons: through processes of shared responsibility, in laboratories for self-organization and through freedom in solidarity. Commoners realize that which is already possible today, and will become obvious tomorrow. This is shown by over 40 examples from across the world. This book expands our notions of the possible when it comes to the organization of economics and society. With contributions by Nigel Gibson, Marianne Gronemeyer, Helmut Leitner, Etienne Le Roy, Andreas Weber, Rosa Luxemburg, Anne Salmond, David Sloan Wilson and more. Silke Helfrich ist Autorin und Commons-Aktivistin, Bloggerin und vielgebuchte Rednerin. Sie lebt und arbeitet in Jena. Sie ist Mitbegründerin des Commons-Institut e.V. und - gemeinsam mit David Bollier und Michel Bauwens - der Commons Strategies Group. Sie betreibt das deutschsprachige CommonsBlog. David Bollier ist ein amerikanischer Commons-Experte und -Aktivist, Blogger und Berater. 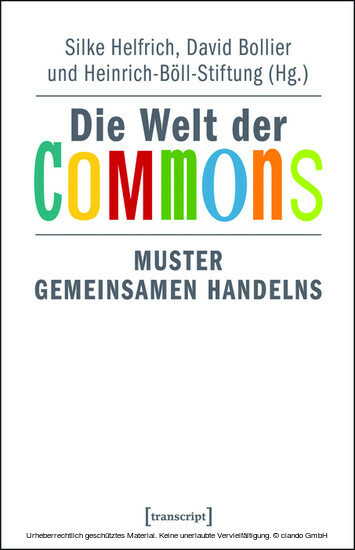 Der Autor zahlreicher Beiträge und Bücher zum Thema Commons als neuem Paradigma für Wirtschaft, Politik und Kultur ist Mitbegründer der Commons Strategies Group. Die Heinrich-Böll-Stiftung ist eine politische Stiftung, die der Partei Bündnis 90/Die Grünen nahesteht. Sie versteht sich als eine Agentur für grüne Ideen und Projekte, eine reformpolitische Zukunftswerkstatt und ein internationales Netzwerk mit über 100 Projektpartnern in über 60 Ländern.